PMR - PRECIOUS METAL REFINING SERVICES | PMR dba .999Fine, LLC. 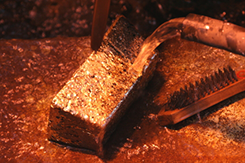 PMR is the preferred recycler and refiner of precious metals. Our refining services encompass high and low grade materials, including gold, silver, platinum and palladium. Our advanced refining processes come from not only the latest and most cutting-edge technology, but also our collective decades of experience in the gold refining industry. Because our company leaders have been in this business for decades, we’re able to provide customers and clients with high yields in short time periods. For PMR, “state of the art” isn’t just a buzzword. Our refining process is faster and less expensive. We truly stay on technology’s cutting edge, employing only those passionate and knowledgeable about gold refining, and those knowledgeable on the latest innovative methods, materials, and machinery used for precious metals refining. X-ray (Spectrophotometer) Analysis Equipment: this technology is used for all assays and ensures the most accurate results in less than one minute. At PMR Refinery, you will never wait a week for your assay results. Monday – Friday 8:30a.m. to 4:00p.m.